EGG ON MY FACE: Kathleen Flake is LDS. My fault for leaping to the assumption that a professor of religious history at Vanderbilt was not LDS. Thanks for the comments that corrected me. Sigh…. Be sure to read the whole thing. Hat tip to the Deseret News LDS Newsline. ..bruce..
As expected, President Thomas S. Monson has been set apart as the 16th President of the Church of Jesus Christ of Latter-day Saints. He has retained President Henry B. Eyring as First Counselor, also no surprise. Most interestingly, he selected Elder Dieter L. Uchtdorf as Second Counselor, making him (I believe) the first non-American to serve in the First Presidency in modern times, underscoring the global nature of the Church (President Monson: “He knows every airport in the entire world…He’s an international man.”). In the meantime, Pres. Boyd K. Packer goes from being Acting President of the Quorum of the Twelve to be President of the Quorum of the Twelve, and thus next in line for succession to the LDS Presidency. Our prayers go with all these men. 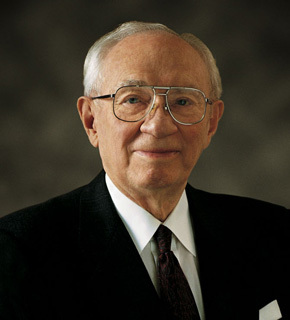 ..bruce..
A group of Latter-day Saints have decided to honor the late President Hinckley by reading the Book of Mormon in 97 days (to commemorate his 97 years of life). They are issuing the same challenge to Latter-day Saints everywhere and have set up a web site where you can register and log your progress. It’s a great challenge and a fitting honor. I’ve signed up; have you? 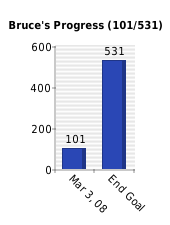 ..bruce..
UPDATE: Below is my current progress chart. Notwithstanding those comments, there is an excellent posting over at Mormon Wasp that discusses why there was a delay in reorganizing the First Presidency after the death of John Taylor — due largely to deep disagreements among the members of the Quorum of the Twelve over (a) whether the First Presidency should be reorganized at all and (b) if so, who should serve in it. The posting is fascinating and has links to additional related documents and articles. Read the whole thing. ..bruce..
Elder Henry B. Eyring was presented and sustained as 2nd Counselor in the First Presidency, replacing Pres. James E. Faust, who died earlier this year. Elder Quentin L. Cook was presented and sustained as a member of the Quorum of the Twelve Apostles; he had previously been serving as a member of the First Presidency of the Seventy. Even as I type this, Pres. Boyd K. Packer is talking about how LDS ministry and leadership differs from other churches. ..bruce..